When it comes to home improvement, go with Mark’s Windows & Doors in St. Catharines, ON. We offer full-frame and insert window replacements, as well as door installations. On top of that, we carry products from Ostaco, a leading door and window supplier in Toronto. Always keep in mind a front door is used two times a day. Spending money on a good quality door followed by a great installation will hep you to keep enjoying your investment for years to come. This method is more cost-efficient because it requires less work and produces a minimal amount of garbage. 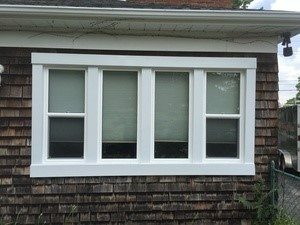 However, the real benefit of window inserts is that you can keep your old trim. If you have a house that is at least 50 years old, you won’t have to dispose of the trim. We make it a point to leave your wood frame completely finished. This is done by bending aluminum cladding to cover your window frame, making it watertight with thermoplastic caulking. Window inserts have a couple of minor drawbacks. One is the loss of glass because we are putting a whole, framed window into the old frame. Also, this method does not allow us to check the frame for water damage. You would not want to remove your old trims as newer ones would never match. In the older homes, this adds character to your home. This method is a more thorough way to check your home for any problems that are caused by rain or snow. All trim frames and old caulking are removed, right down to your house’s framing. If no signs of damage are found, we will proceed with the window installation. The outside portion (brick mold) should fit with a gap of 1/4th to 3/8th inches (or half your finger width) all around to allow the window to be levelled and squared. On the inside, the gap should be 1 inch at most. If the gap is bigger, a filler should be used to prevent your windows from being over-insulated. Shims are necessary to comply with any window company’s warranty. Before we screw in the window, we will place 3 shims along the sill and 2 to 3 shims at the sides. After the windows are shimmed, screws are placed through the shims and into the framing of your house. Once all screws are set in place, we will spray in the form. When the window is insulated, the jamb (wood that goes from the window to the drywall’s interior) and casing trims can be installed. We will make sure that they are all mitered or glued. After that, we will fill the nail holes to ensure an airtight interior and apply caulking. Our final step is to caulk the outside brick mold into the brick or siding. All holes will be filled. To ensure an air tight seal we apply caulking to three places of your new term. Selecting a door is probably the hardest and most expensive part of the process. Depending on the glass, paint colour, and material you choose, a door could cost you $3,000 or more. You can also choose a storm, steel, or fiberglass door depending on your needs. Always keep in mind that a door is opened at least twice a day. If you want to make a good investment, you should spend more on the installation than the actual door. Doors require a little more attention than windows because of their high usage frequency. Spending a little more on a good quality door will save you money in the long run. However, without a great installation, your money will not be well spent. Sealing the door in the frame and placing the shims correctly are very important. A lot of poorly installed doors open and close on their own, and we do not want you to experience that. Also, we encourage you not to recycle your old door handle if it has already been overused. We meet all Energy Star guidelines in every project. Call us at 905-327-3971 for a free quote.